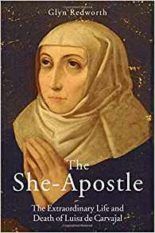 World expert on English and Spanish early modern history Glyn Redworth’s The She-Apostle: The Extraordinary Life and Death of Luisa de Carvaja, tells the weird and wonderful story of the first female missionary since Roman times. (‘A literary coup’ – John Guy, Sunday Times, ‘A beautifully crafted biography of a remarkable personality’ – Prof. Ronald Hutton, THES.) Glyn is currently working on a biography of Philip the Brief of England, better known as Philip II of Spain.